It's déjà vu all over again, but with monetary inflation thrown in for good measure. Yes, here in the U.S. we're nearing income tax season. We have the Internal Revenue Service (IRS) on the brain, and it's usually not a good feeling, either because we owe money, or we have to fill out those infernal forms by April 15th. "Fiscal activity?" What could that mean? We rush to open the message, which at least bears no attachment. I say "latest version" because I displayed a more artfully crafted instance from almost two years ago here. Notice that the amount has risen by over a couple of hundred smackers. 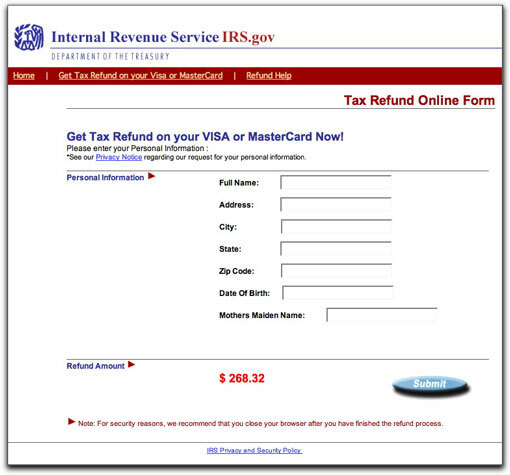 The amount of this supposed refund is duly and prominently displayed on the page. There was no indication of the amount being passed along to the phony site in the link URL, so I guess everyone is getting a $268.32 refund on this campaign. Whoopee! It's kinda funny that the IRS wants your mother's maiden name here, yet they do not collect that information on otherwise invasive tax forms. But, ooh, that logo looks real, and the Submit button has a drop shadow. It must be legit, right? The program running behind these pages is not merely a form-data-grabbing automaton. It actually tries to verify that the credit card number you provide is a valid number (or at least valid first eight digits). It simply won't accept totally bogus numbers. I get a kick out of the Note at the bottom of these pages, recommending that you close the browser after submitting the refund request. 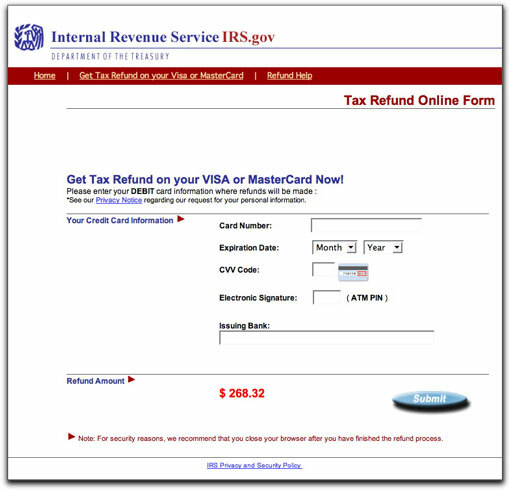 I think that's to prevent the casual user from accidentally noticing after the fact that the URL in the address bar isn't irs.gov or anything close. If this seemingly complex web site seems like a long way to go to capture personal identity and credit card data, you'd be right. But it means that such data is still valuable enough to make it worthwhile for someone, somewhere to develop the software behind this activity. This is most likely a kit of some kind that anyone desiring to rip off people from their home-based business can find on the Internet. Thus, the "kingpin" behind it all collects moolah no matter what—and, as has been detected elsewhere, may even be stealing the captured data from the kit buyers who do the legwork installing the kit on hijacked servers and paying for the botnet mailings. 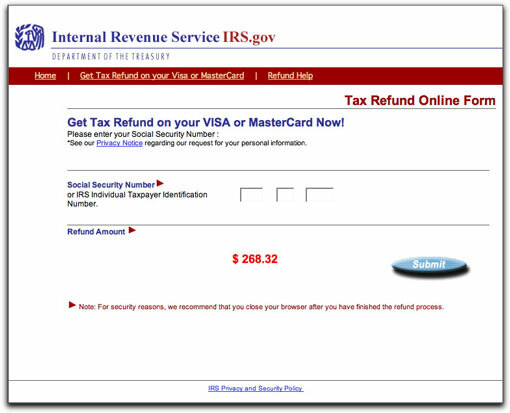 So, what's the difference between the IRS refund scams of 2006 and 2008? Simply the promise of a $204.52 larger refund. The value of identifying a scam when you see it? Priceless. 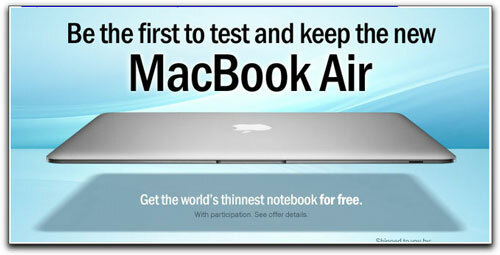 I guess Apple couldn't find anyone to test a MacBook Air. Yah! These "with participation" spams use the good brand name of a company whose products or services consumers like and trust in order to coax recipients to open the message and then act. The brand-name companies don't have a clue that their products are being spammed until after the fact. I've seen spammers wave high-value gift cards (Target and Macy's before last Christmas) and tickets to popular TV shows, such as Oprah (I believe that it's in violation of FCC regulations for TV show tickets to be anything but absolutely free) as lures to grab "participants" (a.k.a. greedy people wanting something for nothing—which turns out to be not for nothing). The brand name always appears in the Subject: line to make sure you see it in your inbox. 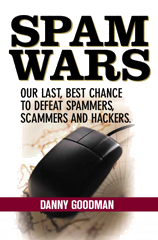 Spammers who operate these programs in the open (i.e., they provide CAN-SPAM compliant identities and addresses) include disclaimers that apparently keep the brands' and FTC's lawyers at a sufficiently safe distance. The outfit trumpeting Southwest Airlines' brand yesterday included a notice in the email message that it "is not affiliated with, sponsored by or endorsed by any of the listed products or retailers." This statement is in the grayed-out fine print that no one (except me) reads. Companies that send these spams call their activities "rewards programs." Reward, as in a treat they toss to a dog for rolling over. As in the $20 they leave on the nightstand at an hourly-rate motel. Here's a simple two-part quiz. Q1. What does the following email Subject: line mean to you? A1. In the travel biz (and elsewhere), a confirmation is an acknowledgment of an existing reservation; it's an assurance that a seat, a car, a room is being held in your name. True, sometimes there are snags (e.g., overbooking), but holding that confirmation gives you the power to really get in the agent's grill with your demand for whatever it is the outfit has confirmed. Q2. What does the following image in the message body mean to you? A2. Oh goodie! I can click the red button (actually, a flashing animated image in the original) to claim my two free Southwest Airline tickets...tickets that (according to the Subject: line) have been confirmed! Woohoo! Oooh, sorry. No, the correct answer is "Ugh, I'll have to jump through hoops from now until Julune, hand over all the email addresses of my friends to spammers, and probably buy stuff first." "Free" may not be exactly free, certainly not when you measure the time you'll spend completing the various precious metal offers. And that "Purchase may be required" stipulation? "Maybe" my eye. When consumers arrive at Member Source Media's promotional Web pages, they are led through a series of ads for goods and services from third parties. To "qualify" for their "free products," consumers must first wade through pages of "optional" offers. If they clear this hurdle, they discover that they must "participate in" a series of third-party promotions that requiree [sic] them to do things such as purchase products, subscribe to satellite television service, or apply for multiple credit cards. It's unclear to me if the offenders in the recent FTC action mentioned the "participation" business in their email messages. It could be that our Southwest Airlines offer spammer includes these disclaimers to stay just this side of last month's ruling. I also haven't visited the site to see how they state their offers and details—links are heavily coded with an identifier for my email address, and I don't want to validate it as being a good one. But, even if they tell you up front what hoops you will be jumping through, I still have an issue with the Subject: line of this email message. Part of the FTC complaint addressed deceptive headers in the other case, leading me to hope that there might be something for them to look into here. The CAN-SPAM law has had a weird effect on different types of email marketers. Those who use genuine confirmed opt-in mechanisms to stay in touch with their customers have been sweating the details to make sure they comply with the law completely and unambiguously. Then you have the spam mills operating in the open who seem to want to test just how high their Icarus-like wax wings will let them fly. Is there a potential upside to global warming? UPDATE: See the follow-up to this entry.